Credit: C.S. Mott Children's Hospital National Poll on Children's Health at the University of Michigan. 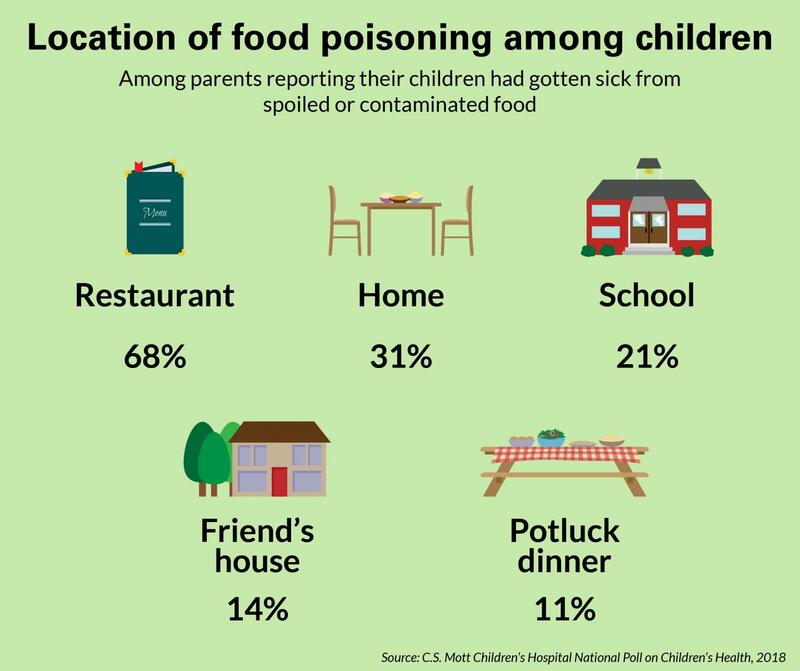 But few parents are using some simple strategies to protect kids from food poisoning outside the home, such as at a potluck or restaurant, according to a new report from C.S. Mott Children's Hospital National Poll on Children's Health at the University of Michigan. "In most cases children recover quickly from food poisoning, but in certain cases it can be debilitating," says Mott Poll co-director Gary L. Freed, M.D., M.P.H. "It's impossible to completely protect children from food-borne illness. However, there are strategies to try to reduce the risk of getting sick from eating spoiled or contaminated food. We found that while parents paid closer attention to food safety in their own home, they were not always as cautious about outside sources." Other sources of kids getting sick from spoiled or contaminated food included school (21 percent), a friend's house (14 percent), or at a potluck (11 percent). "Contaminated food can make both kids and adults very sick very quickly. For very young children, whose immune systems are not fully developed, this kind of illness can present a greater risk of serious complications," Freed says. "Simple precautions, like checking restaurant inspections and following food safety rules when cooking and storing food, can help keep your family safe."